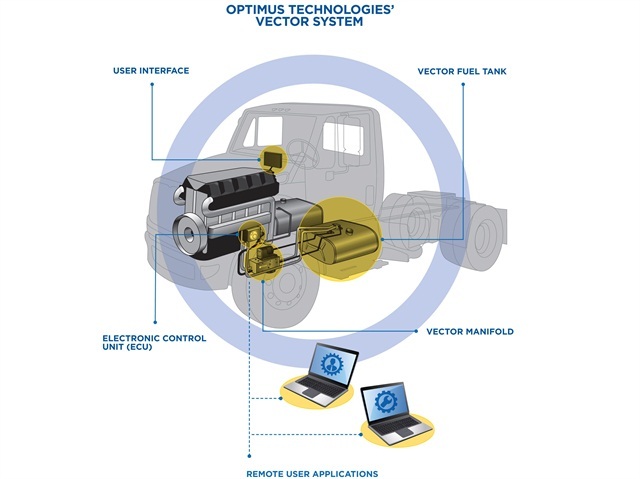 Optimus Technologies announced that it is the first to receive U.S. Environmental Protection Agency approval for an advanced biofuel conversion solution for existing medium- and heavy-duty trucks. Additionally, the company added that while it is approved for a wide range of fuel types, it is also the first to achieve compliance for use with pure biofuel derived from recycled cooking oil. Optimus Technologies estimates that the solution reduces fleet fuel costs up to 25% and reduces lifecycle emissions up to 80% without the prohibitive start-up costs of compressed natural gas (CNG). The solution is based on a combination of Optimus’ Vector bi-fuel (diesel or biofuel) conversion system — hardware and software that bolts on to existing diesel engines — and certified, pure biofuel. Fuels tested were derived from a variety of bio-sources including non-food grade corn oil, recycled cooking oil, and pure biodiesel (B-100). While Optimus may be first to the U.S. market, such solutions have been available in Europe for more than a decade, the company stated. Optimus’ solution can leverage current facilities with only minor modifications, offering paybacks as little as one year, according to the company. Optimus currently works with a network of advanced biofuel suppliers whose fuel meets the Optimus standard. Emissions tests conducted for Optimus’ approval in May were performed and validated by the West Virginia University Center for Alternative Fuels, Engines, and Emissions. The results showed a significant overall reduction in tailpipe emissions in comparison to diesel. Specifically, particulate matter was reduced by about 40%. Further, nitrogen oxide (NOx) emissions were reduced with all fuels tested, including when used with B-100. The Vector system was approved for use on Navistar DT466 engines between the model years 2004 and 2006. Field trials and certification tests on other engines are currently underway.